Recently, I posted about my plans to renovate my kitchen. 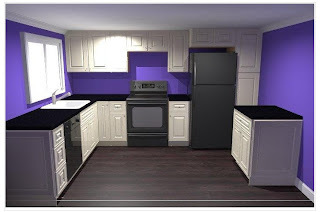 This is a project I want to get started on as soon as possible. Why the rush? I believe my kitchen is de-evolving before my very eyes. It began as ugly. From there, it moved to dysfunctional. Now it's heading to the territory of just plain BROKEN. Kitchen rehab becomes a pressing issue when you have to put a bucket under the garbage disposal in order to run the dishwasher. To more quickly build up the Kitchen Renovation Fund, I'll be limiting my spending over the next couple of months. I'll try to stick to projects for which I already have materials on hand. For example, I can start working my way through my fabric stash. Sitting in the air conditioned house sewing sounds like an ideal way to spend this weekend. It's too hot to go outside. I used to sew a little bit from time to time. But frustration with certain aspects or techniques made sewing less than enjoyable, and I didn't pursue it much. That changed when I bought a serger (overlock machine). With a serger, I can use shortcuts to avoid some of the most annoying parts; for me, those include waistbands and hems. Many sewing patterns instruct you to use the "stitch in the ditch" method of attaching a waistband. This involves interfacing, measuring, folding, ironing, clipping, pinning... well, that's about six steps too many for me. Then there's the annoying process of sewing blindly while hoping that you're catching all the fabric layers correctly (while almost certainly NOT catching all the layers). I hate stitch in the ditch. The serger shortcut saves me time and an enormous amount of frustration. The steps below show an elastic waistband in a casing. With minor modifications, you can also use this shortcut for a zipper waistband. First, cut out the waistband according to the pattern. If desired, serge each end to prevent fraying. Place the ends with right sides together, and stitch just past the fold line (center). Leave an opening of about 1" for the elastic. Stitch the rest of the way. Be sure to backstitch at the start and end of each line of stitches so that your seam is sturdy. Fold the waistband (now a loop) lengthwise along the fold line, wrong sides together. Press if desired. Pin the waistband to the skirt, right sides together. (The side of the waistband with the elastic opening is the "wrong" side.) Because I'm a menace with pins and inevitably stab myself, I use as few as possible - usually just four. Here I have one at each side seam, one at front center and one at back center. 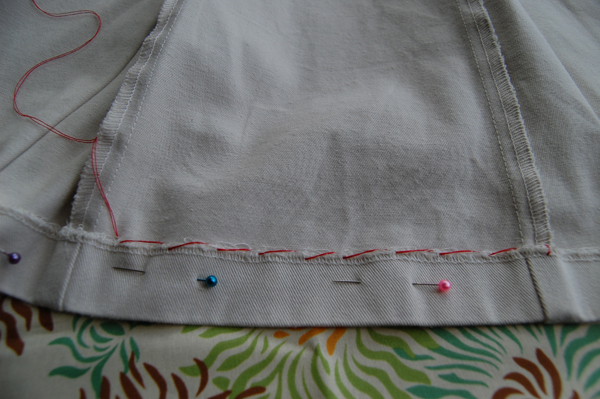 With your regular sewing machine, baste the waistband to the skirt. If you used more pins in the previous step and/or you're confident in your serger skills, you can skip this step. Serge the waistband to the skirt. I line the fabric up so that the serger knife is just a hair to the left of the basting. This will ensure all the basting stitches are cut off, leaving a nice neat seam. On the outside, the waistband looks very tidy, with no visible stitches. Run the elastic through the opening and stitch the ends together. Done! But we're not here to talk about boxes. We're here to look at red & black! Among the responses to my last post were wise admonitions to keep counter space in mind and smart suggestions about islands. I had been thinking along those same lines and had created a couple of designs incorporating an island. 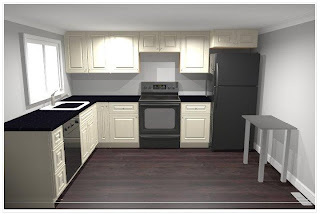 The 3D planner doesn't offer islands, so I used a table and a cabinet as an approximation. 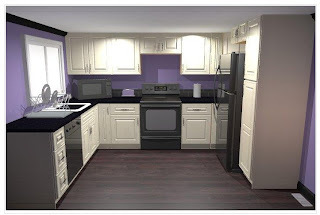 The planning tool does offer tile/backsplashes as well as countertop items such as microwaves, toasters and dish racks.